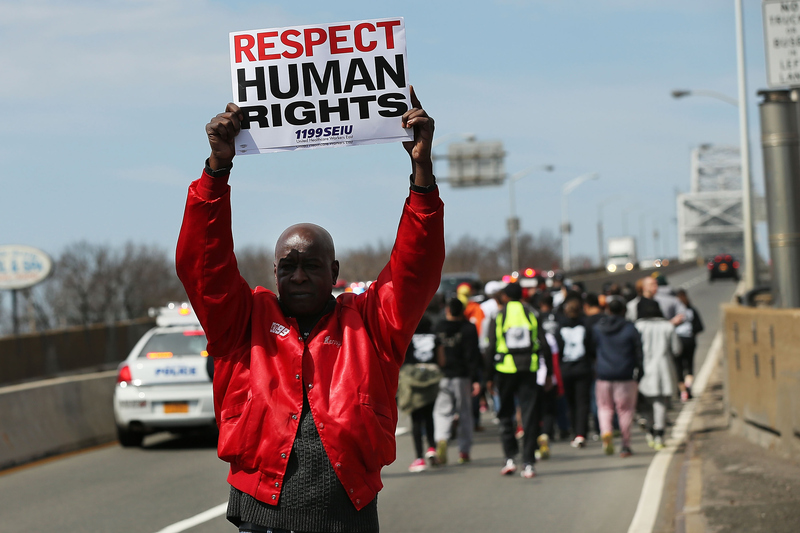 The fight for human rights in America is still alive and well. After the death of Baltimore resident Freddie Gray on Sunday, protesters began swarming City Hall, demanding justice and a thorough investigation into the incident. According to police reports, Gray, who had been arrested on April 12 and sustained mysterious injuries during transport from the scene, had suffered from a nearly-severed spinal cord and three separate broken bones, which left him in the trauma care unit of a local hospital for a week. On Monday, at least one of those planned Freddie Gray protests in Washington, D.C., had caught the attention of national media and was making serious waves. According to the group Justice League NYC, the 250-mile March2Justice (which began in New York City on April 13, and made a stop at the Baltimore Police Department Precinct on Saturday) is scheduled to conclude with a large rally at the West Lawn of the Capitol building in Washington on Tuesday. On the group's official Facebook page, listed speakers included actors Danny Glover and Jussie Smollett, hip hop artist Mysonne, and First Command Sergeant Major Michele S. Jones. "[We're marching] to demand action on legislations to end racial profiling, demilitarize our police forces and shift juvenile justice from institutionalization to alternatives and prevention," wrote the group on its Crowdrise page, which aims to fund supplies for the marchers. "This is not an isolated incident in Baltimore," Justice League NYC leaders said in a statement on Sunday, citing the group's dedication to bringing justice to the families of Tyrone West and Emmanuel Okutuga as well, both black men who were killed by Maryland police officers during the process of arrest. On Sunday, Baltimore Mayor Stephanie Rawlings-Blake ensured community members that the city would continue investigations into Gray's death until it was satisfied that justice had been served. "Right now we are still collecting details surrounding this incident, but I want our residents to know that we will get answers," said Rawlings-Blake in a statement. "I want to let people know that we will find out exactly what happened, and we will hold the right people accountable." Luckily for both Gray's family and the protesters, the Baltimore mayor is no stranger to departmental accountability. According to The Wall Street Journal, in October 2014, Rawlings-Blake personally requested a review into the city's use-of-force policies and practices by U.S. Department of Justice officials. So far, protesters have used the heightened visibility to speak out against police brutality issues and the supposed culture of secrecy that they believe impedes the rights of minorities everywhere. "I have a son that lives in that neighborhood, my family that lives in that neighborhood and quite frankly, we are very concerned," Cortly Witherspoon, president of the Baltimore chapter of the Southern Christian Leadership Conference, told NBC reporters on Monday. "We're not fearful, we're not tired but we are determined to fight the good fight." If you're looking to get involved, and you live in the Washington, D.C. area, you can join Justice League NYC at their planned rally on the West Lawn of the U.S. Capitol building on Tuesday evening at 5 p.m.